Steve Donovan and I flew over to Weifang via Narita Tokyo. We had to overnight at Narita, which was an interesting experience. The next day we flew into Qingdao in Shangdong Province We were then bussed up to Weifang which took about 2 1/2 hours. We passed several truck accidents on the way, which were pretty bad. We found out 3 truck drivers died on this stretch of road that day. Apparently the drivers heat their truck cabins and then fall asleep at the wheel. We arrived safely at Weifang late afternoon and settled in to our room. The first most obvious difference from what I was expecting was the Bailang River was dry. The river was being cleaned up which was good news from what previous people had told me. 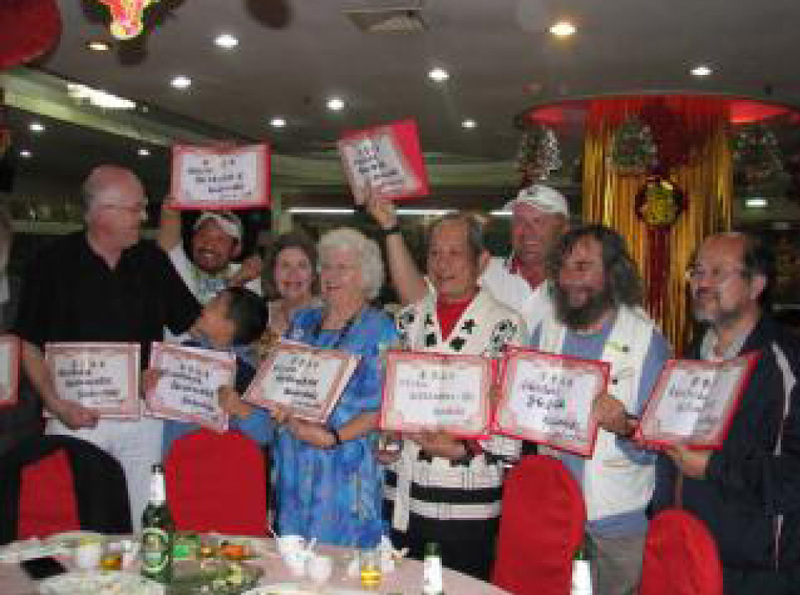 At dinner that night I was introduced to Mr Liu Zhiping the Festival organiser and several other dignitaries. The food was certainly not what I expected and I had to contend with Chop Sticks. I must admit I would not use chop sticks back home, as I would always say I wanted to eat my food, not play with it. Being in China I was determined to use chop sticks so I persisted with them. Several people got some laughs at my expense. 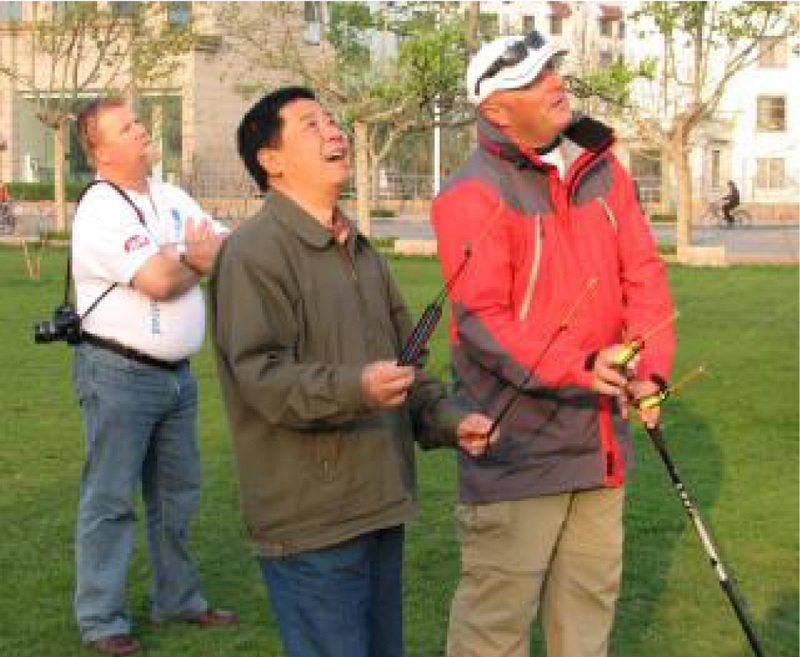 Steve and I had got to Weifang a few days ahead of most people because Steve was the Chief Judge and he needed to sort out final preparations for the kite competitions. Steve had also been nominated for the executive committee of the International Kiting Federation and attended a meeting to meet fellow executives and discuss kiting issues. This gave me time to settle in and get use to Weifang, the local food and the traffic. Crossing the roads there is like playing Russian roulette. You need to be very careful and it took me some time to get use to. Through Steve’s contacts we were able to tour a local kite manufacturer run by T an Xin Bo. 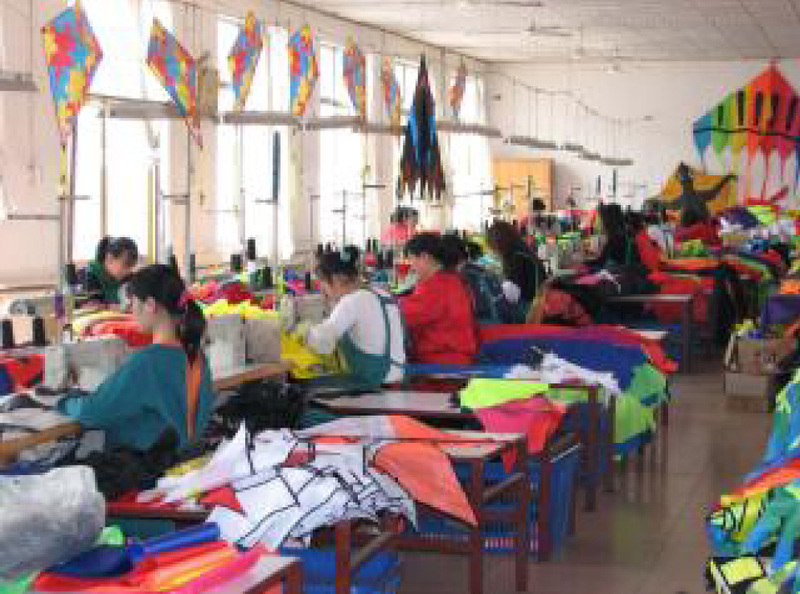 He manufactures single line, duel line, and large inflatable kites which are shipped all over the world. It was fascinating seeing how kites are made and the screen printing techniques used on kites. Our host generously took us out to lunch and tried to fill us full of wine & beer. We obliged with a few drinks but did not over indulge. We were also taken to a kite expo where many local kite manufacturers were displaying kites for sale. 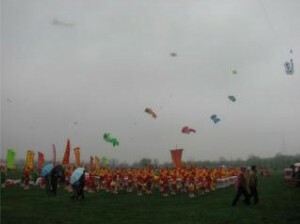 Several kites were purchased many with Beijing Olympic themes on them. Noel Mooney, (Coolum Kite Festival organiser) arrived a couple of days later and caught up with us. We all went to the Kite Museum which was just amazing. 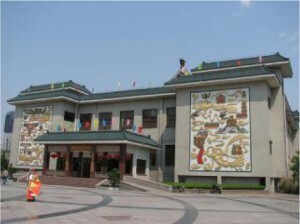 This Museum is a large double story building and it is dedicated solely to Kites from China and all over the world. It has an amazing variety of kites of all shapes and sizes. Next to the Museum is a large square also dedicated to kiting and it is here I was shown the Queensland Kite Flyers Society plaque. Naturally photos were taken proudly next to the plaque. 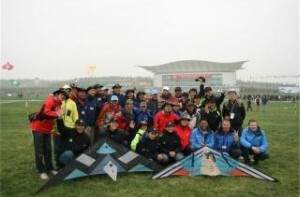 Steve introduced us to Mr Qian who is the Kite Master of the Weifang Kite Museum. Steve knew Mr Qian previously and they have developed a close bond. I was privileged on several occasions to see him fly bird kites (hand made by him) indoors at the Museum and outdoors at the local park. His lovely wife also works at the museum and is an excellent artist. She paints traditional scenes and figures onto kites Mr. Qian makes which are then sold to the public in the Museum. I was amazed watching her paint and admired the kites hung on the wall for display. I was very honoured to receive one of these kites as a gift and I will treasure this always. 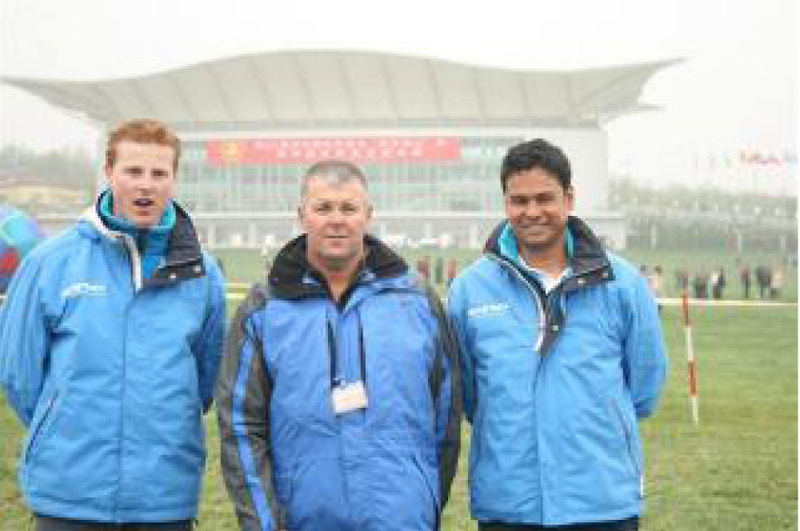 Prior to the start of the festival Steve, Noel and I were interviewed by Weifang TV on separate occasions. This was an interesting experience. The locals certainly liked talking to us and getting photos of us taken with them. Unfortunately just as the Kite festival started the weather turned sour thanks to a typhoon further south and the rain came. So off we all went to the opening ceremony in the rain and it was cold. 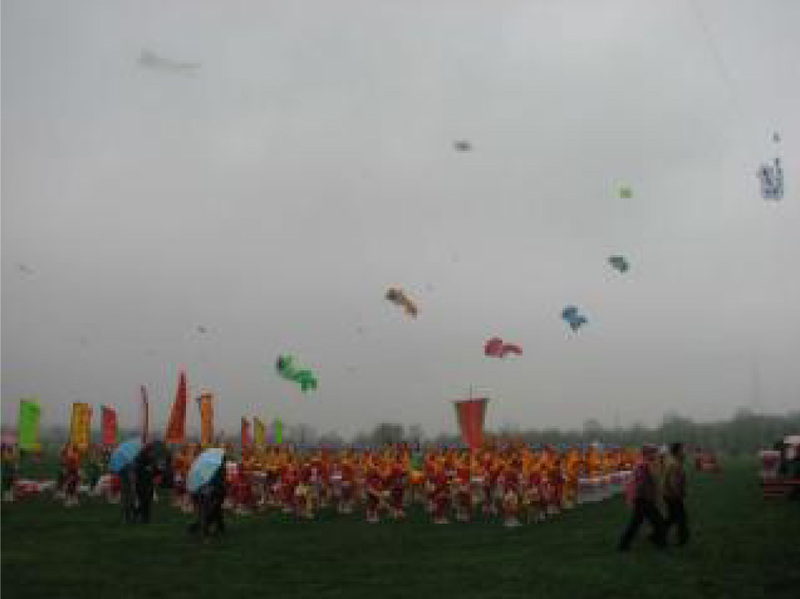 Kite Flyers from all over the world were lined up in country order, so being Aussie’s we were the first of the line. While we waited for the start Noel and I admired the beautiful Chinese girls dressed in traditional dresses. As it was raining they were all wearing raincoats to try and keep dry. 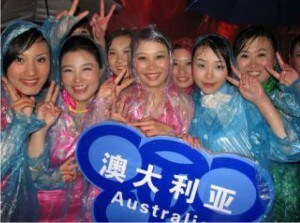 We said hello to them in Chinese, which got their interest, and we got some photos with them and the Australia sign. Just after the Ceremony started we were led up onto the stage and then led down through the crowd to our seats. arrived the day before the competition started, jet lagged and tired. This didn’t give us allot of time. We could not get to the flying field so we did some stick practice to the music in our hotel room. The guys were impressed that I new the routine and it showed that I was serious. The first day of the competition the weather set in and it was raining and cold. Luckily for us we were to be the 10th team to fly so this would give us some time to practice the 3 compulsory figures required. We did more stick practice under cover of the Netherlands tent to keep out of the rain as there was little room available on the flying field. The competition was cancelled that day due to the weather. My 2 team mates and I waited for the crowd to ease then stood in the rain to practice our ballet routine. A kite Ballet routine is a freestyle flying sequence in time to a piece of music of your choice. This was the first occasion I had to try out their Define Team Kite (made by team mate Stephen). I had to get use to the running required to slow or speed the kite up to keep in time with the music and the other guys. As most people were cold and wet we were told by the organisers that everyone was to return to the hotel. We wanted to stay out all afternoon to keep on practising. We were told we had no way of getting back on our own. So we had little choice but to head back to the hotel. We were not happy about this. A tour of a local sport kite manufacturer filled in the rest of the day. It was fascinating looking over the manufacture of sport kites and we bought some stunt kites with Olympic rings on them to fly at Coolum Kite Festival this year. Noel purchased a rev 1.5 copy, as he is keen to learn how to fly 4 line Revolutions. We practiced again using sticks that night to help me get use to the routine we would be flying. Day 2 of the competition started similar to the day before with rain. We headed straight to the competition flying field as no one was flying there and got about 40 minutes of flying practice. At the pilot briefing we were told the competition would go ahead so we all set up ready to go. Luckily as the competition started the rain eased off. We had a chat with an anchorwoman from NBC America and were later interviewed by her and her film crew while waiting to fly our routine. They were very fascinated in how we managed to get together to fly in the sport kite competition. NBC were in China doing some preliminary work in the lead up to the Beijing Olympics. Weifang TV also interviewed me again to get my thoughts on the Sport kite competition. We watched all the teams fly before us and there were some impressive performances. So it was our turn to set up and go. I was rather nervous as this was my first sport kite competition and I did not want to disappoint my new team mates. Our music started and we flew the routine, I made a few mistakes but managed to get back into the slot and we managed to finish without hitting each others kites or being disqualified for flying outside the boundary of the field. We congratulated ourselves for getting through the routine without major mishaps to applause from the crowd around the flying field. We thought our routine wasn’t too bad considering the short time we had flown together and figured if we were lucky we may get a place. The results were to be kept secret until the night of the awards but later that day a rumour had got out that we had actually won the competition. At hearing this news we were most surprised as we had figured several teams had flown better than us. That night Steve, Noel and I were generously taken out to tea by Mr Qian (Kite Museum Master), along with his wife and family. Our Interpreters Angela and Frank also attended which made it easier to communicate with the Qian family. This was another occasion the wine was flowing freely but after trying this and equating it to paint stripper I stuck to the local beer. Noel however took a liking to it and paid for it somewhat the next morning. It was a very enjoyable evening and I was very honoured to be invited. Early the next day we all headed back to the Kite Museum so we could photograph the Queensland Events banner out the front. Noel had it brought over and due to inclement weather during the competition we were unable to get it hoisted by Graig Hansen’s (Peter Lynn kites) big inflatable for photos. It was then back to the hotel for breakfast. A tour was organised that day for everyone up to the mountains. Steve, Noel and I decided we didn’t fancy a long time spent on a bus so stayed behind. We got some money exchanged, walked around and did some local shopping for kites. 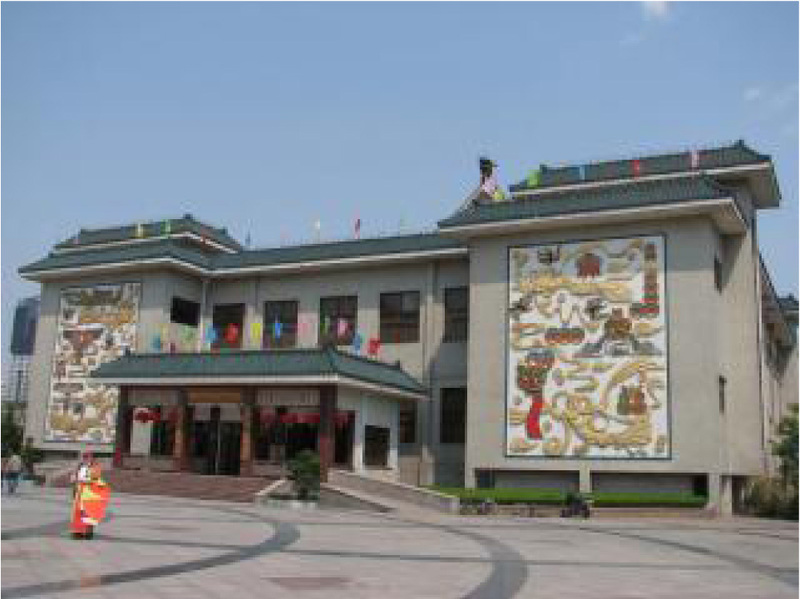 We then went back to the Kite Museum, caught up with Mr Qian again and flew kites out the front of the Kite Museum. It was fun flying kites there over marble paving. As was usually the case a crowd gathered to watch us fly. Few people have flown kites out the front of the Museum so it was another great experience for us. Many photos were taken. Later we gathered for the awards night and I was dressed naturally in our Team Mascotte colours. Our team was ushered to a specific table and told then that we were prize winners and we were to stay there until called. My two team mates presented me with the kite I had flown in the competition and both had signed it. I was absolutely thrilled the guys had given me the kite as I was very keen to get hold of it. I was hopeful they would give it to me and was prepared to buy it from them. I was also given a Mascotte fridge magnet to add to the shirt and hat previously given to me. Their sponsors certainly look after these guys. There were several different classes of kite flying for this festival and the results and medals given out. I was surprised and excited to see Noel Mooney walk from the stage having been awarded a Bronze Medal for single line traditional kite display. The World Sport Kite competition was the last result given out and Team Mascotte (my 2 team mates and I) was announced as the Gold Medal winners. So it was now official we had won the Gold. We were absolutely amazed that we managed to beat all the teams and win. So up onto the stage we went to receive our gold medals. This was a magic moment for me and one I will never forget. We were like celebrities then as many people lined up for a photograph with us. As the presentation dinner came to an end, my team mates had to have an early night as they were leaving at 4am for a bus back to the airport. So unfortunately we didn’t get much chance of celebrating our win together. So a few beers were had at KTV karaoke as kite flyers and interpreters sang songs while I was still getting use to the fact I had a gold medal to take home. Steve, Noel and I were up early the next morning to have our last fly in the park with Mr. Qian. I must admit this was a sad moment for me as you cannot help but form a bond with this amazing man. So after our goodbyes to Liu Zhiping, his staff and the interpreters, Steve and I caught a bus back to Qingdao for another kite festival. Noel was to catch another bus and head to the airport and then fly home. 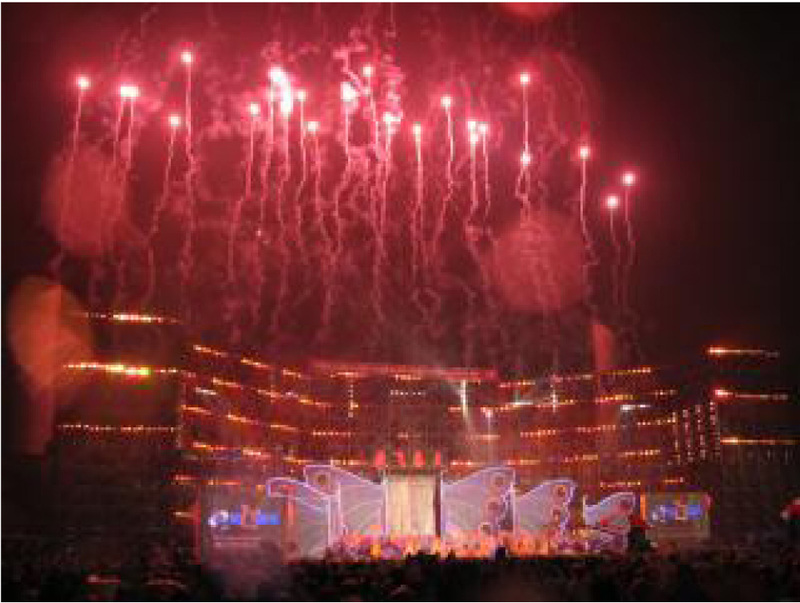 The Qingdao Kite Festival went for 2 days. It was a lot smaller and run differently to Weifang. 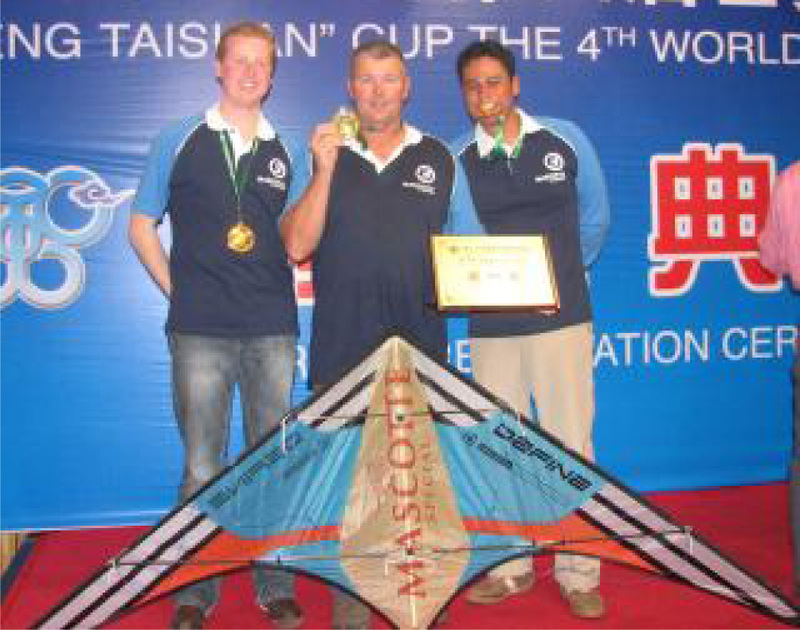 Steve and I looked forward to flying together after the pressure of the judging and competition in Weifang. It was a pleasant couple of days with a fair amount of time spent touring around and taking in the sights. We would have been happier just flying kites. A volunteer interpreter was arranged for us to help with communication. Her name was Snow and she had a very good knowledge of English and spoke it very well. She was very knowledgeable and was very helpful to Steve and I while at the Qingdao kite festival. 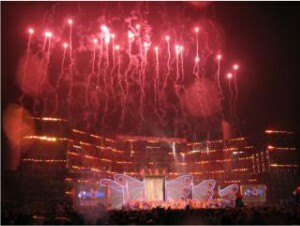 Approximately 60 people who attended the Weifang Festival also attended Qingdao. It was great to socialise with kiters from all round the world. Steve introduced me to many people he had met at previous kite festivals. We were given an award for our team flying displays at Qingdao at their award dinner. This was a very social occasion; many beers were downed as toasts of all kinds were made. Luckily for us the glasses were small so this wasn’t too bad when we had to drink the whole contents countless times. At the conclusion of the dinner we headed out to yet another karaoke club with a few guys from Thailand and Snow our interpreter for some singing. The next day our trip had finally come to a close and we headed back home. Between us we were 30 kg over weight. Steve flashed a Gold medal at the check in counter and told them about our wins. Luckily for us the extra weight was not mentioned or the potential cost we may have had to fork out. So a flight to Narita (Tokyo), then followed by a flight back to Brisbane got us home in the early hours of the day. It was nice to get back and see clear skies and filaments on the few clouds that were around. Once outside the airport it was a relief breathing in some clean air. This was my first overseas International Kiting trip. I had an amazing experience travelling to Weifang in China for their kite festival and never ever figured we would win the gold medal. I met some amazing people and will cherish many fond memories for years to come. The Chinese people I met are all very friendly and the festival organizers looked after us very well. The Interpreters the organizers arranged for us made it so much easier for us when trying to communicate. They were all very helpful and we enjoyed their company when they joined us on several occasions at KTV karaoke. Steve, Noel and I gave all the girls a sport kite each to say thanks for their help. We suggested to them that they could form a Weifang Girls kite Team. To me the only negative I would say about this trip is the pollution, which is quite bad. You can feel it as you breathe. Since joining Team Kaos here in Brisbane I envisaged one day possibly competing in a world sport kite championship. I can now say I have competed in a world sport kite championship and somehow managed to win the ultimate prize on my first attempt. I would like to thank my new team mates Stephen and Rini (Team Mascotte) for allowing me the opportunity to fly in the competition with them. It was a fantastic experience I will always remember. The routine was brilliant and it was a pleasure meeting and flying with them. I wish them luck with their future kite flying. I hope to be able to fly with them again one day. I would also personally like to thank Steve Donovan for all his help and guidance over the last couple of years since I joined Team Kaos. I thoroughly enjoyed travelling with him and Noel overseas and hope to be able to attend many kiting festivals with them. The Weifang Organisers were very thankful to Steve Donovan for his efforts in helping to organise and take on the responsibility of Chief Judge. The Flying competitions went off with out any problems despite the rain. Allot of work went into this as I saw first hand. Steve Donovan is to be congratulated for his effort. He is a major asset to the Queensland Kite Flyers Society. His involvement in Sport Kite Flying in Australia and around the world will help give it the recognition it rightfully deserves. 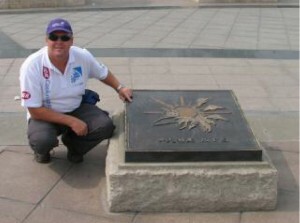 Steve and I had got to Weifang a few days ahead of most people because Steve was the Chief Judge and he needed to sort out final preparations for the kite competitions. Steve had also been nominated for the executive committee of the International Kiting Federation and attended a meeting to meet fellow executives and discuss kiting issues. This gave me time to settle in and get use to Weifang, the local food and the traffic. Crossing the roads there is like playing Russian roulette. You need to be very careful and it took me some time to get use to. Through Steve’s contacts we were able to tour a local kite manufacturer run by Tan Xin Bo. He manufactures single line, duel line, and large inflatable kites which are shipped all over the world. It was fascinating seeing how kites are made and the screen printing techniques used on kites.